驚喜製造團隊打造的無光晚餐是什麼? 無光晚餐好玩嗎? 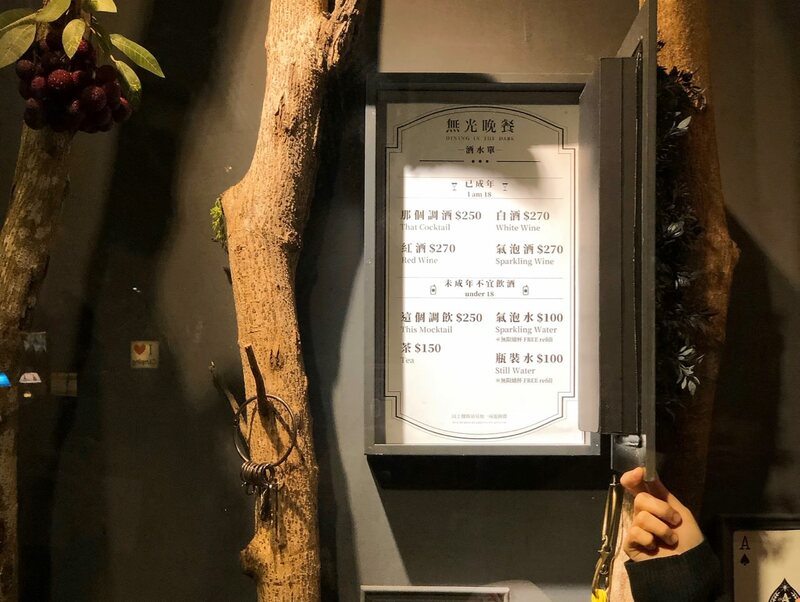 以下文章會提到2019 無光晚餐心得和10個大家都想問的問題. 此外, 這一場將是無光晚餐最終場, 錯過以後在台灣就體驗不到了!! What is “Dining In The Dark” event? Is the event fun? 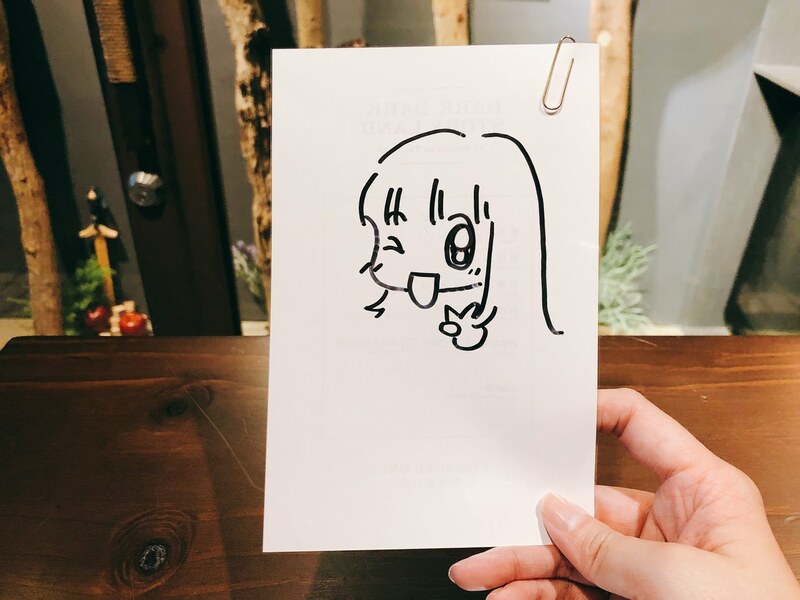 In the article down below, you would read regarding the 10 questions and my review about the event, which is designed by Surprise Lab Team. 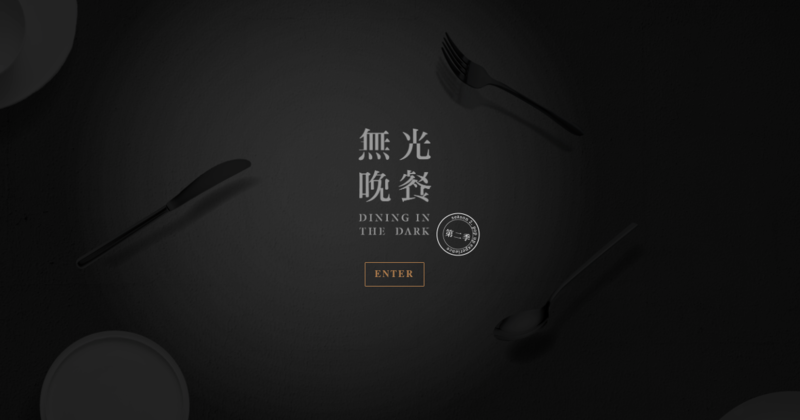 This is the last and final “Dining In The Dark” event in Taiwan. 驚喜製造團隊陸續推出相當多知名的活動 – 例如一人餐桌, 無光晚餐第一季, 和與 Home Hotel 合作的微醺大飯店, 頗有知名度也受到肯定. 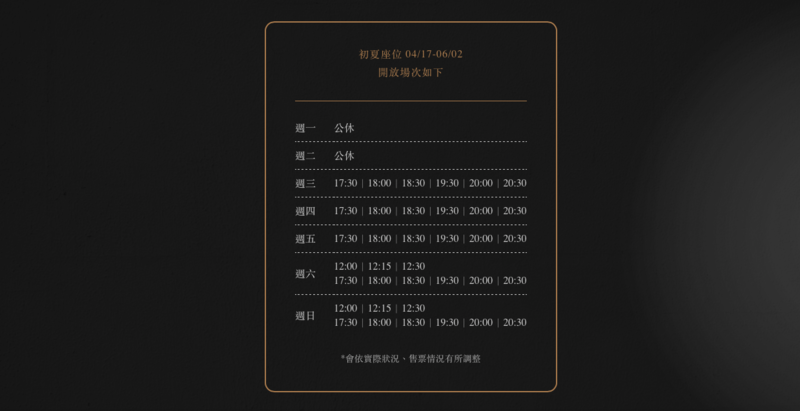 這次在04/11將開始「無光晚餐最終場」的預售, 門票持續熱賣中, 由於我不能太明確寫出體驗內容, 我用文字先告知一些簡單流程. 首先要在訂位時間前 10 分鐘抵達無光晚餐活動現場, 我會建議 15 分鐘前到活動現場, 因為每位參加的客人都會想要無光晚餐的招牌拍照, 再來準備填寫資料, 進行一些有趣小遊戲, 入場前, 主持人講解一些注意事項, 將大型物品或是會發光的物品放進置物櫃, 就準備讓戴著夜視鏡的店員引導客人走進無光源的用餐空間. 以下是大家都想問關於無光晚餐的十個問題, 文末則是有心得與價格. 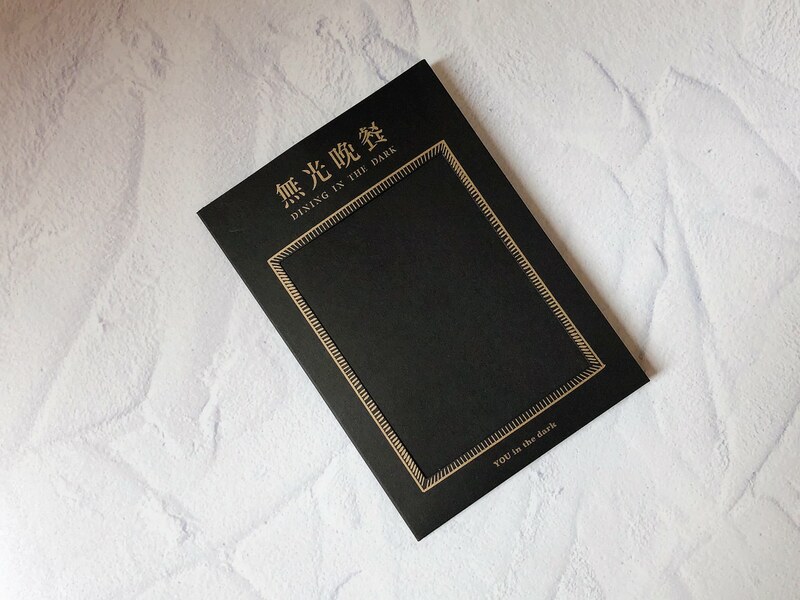 The Final “Dining in the Dark” event ticket starts selling at 4/11/2019. First of all, you would need to arrive 10 minutes prior the reservation time. I would suggest 15 minutes since every guest would want to take the picture of the sign. Second, you would need to fill out forms and proceed with interesting games. Before entering, the host would explain the warning and notification regarding Dining In The Dark. Third, you would need to lock away the large purse or any shiny items. 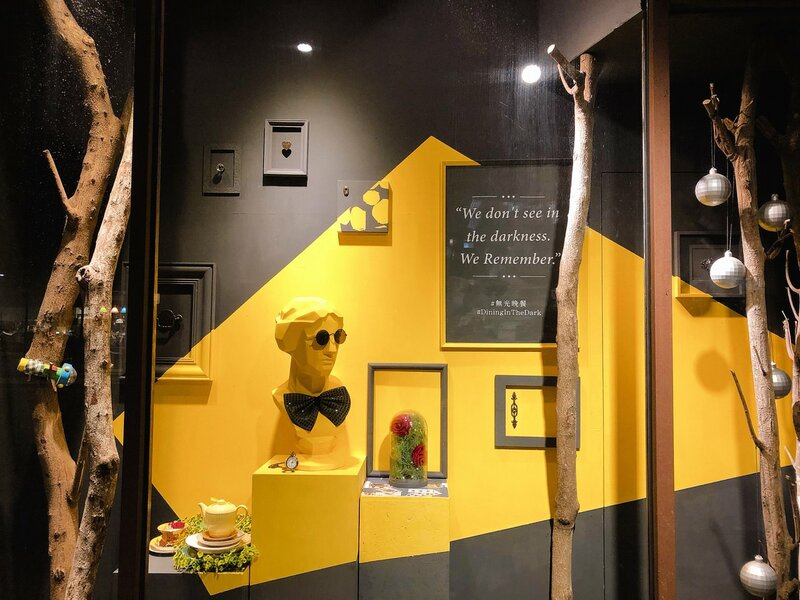 At last, the staff with night goggle would guide you to the dark dining space. 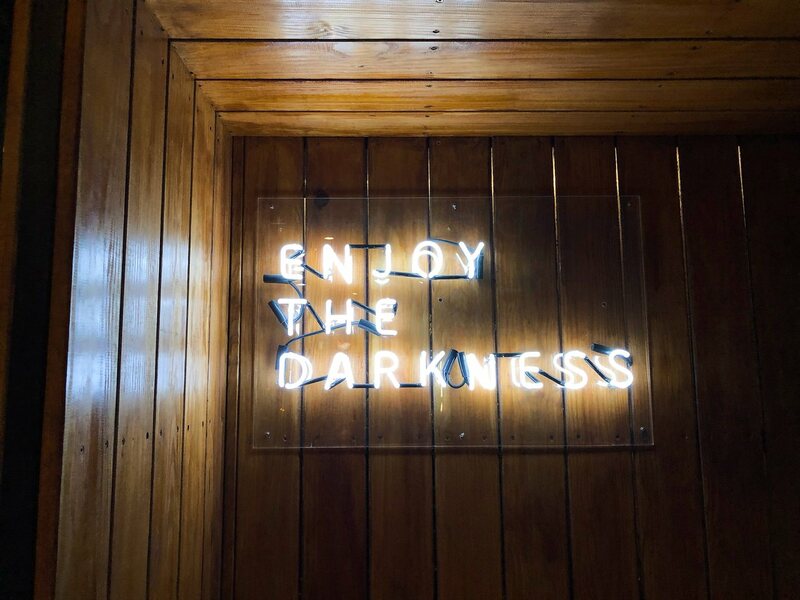 The following article would be the ten questions and my review about Dining In The Dark event. What is Dining In The Dark? As the event name states, it is dining in the completed darkness. It is darker than blindfolded. It is like closing your eyes to dine. However, you might see the night goggle mini green light, just like the firefly. Where do I reserve the Dining In The Dark Seats? The Address? 無光晚餐的地址在台北市松山區健康路9號, 靠近綠色新店線的小巨蛋捷運站五號出口, 非常好找, 不會迷路 , 無光晚餐只接受網路訂位和信用卡線上預先付費, 請把無光晚餐當作一場表演, 需要先訂位和付費才能參加. 網路訂完位後, 隨後會收到一封訂位成功的 Email . 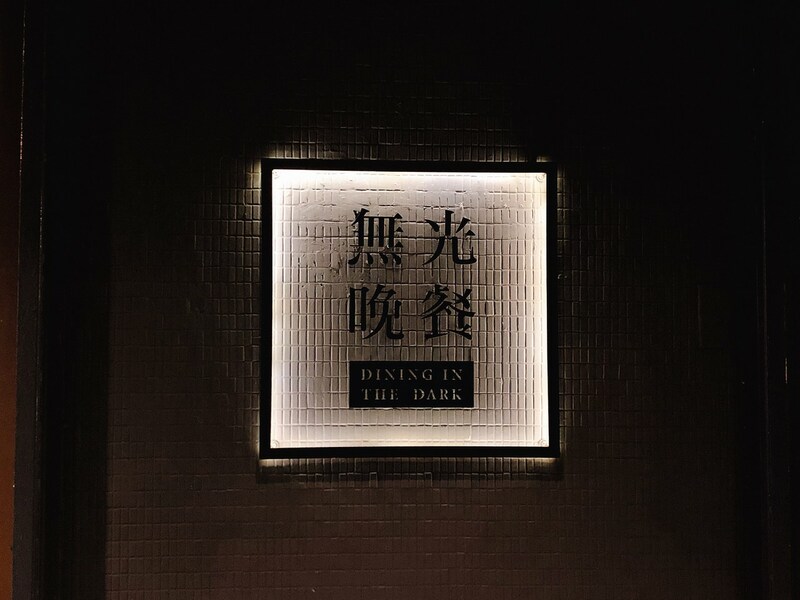 The Dining In The Dark event location is at No. 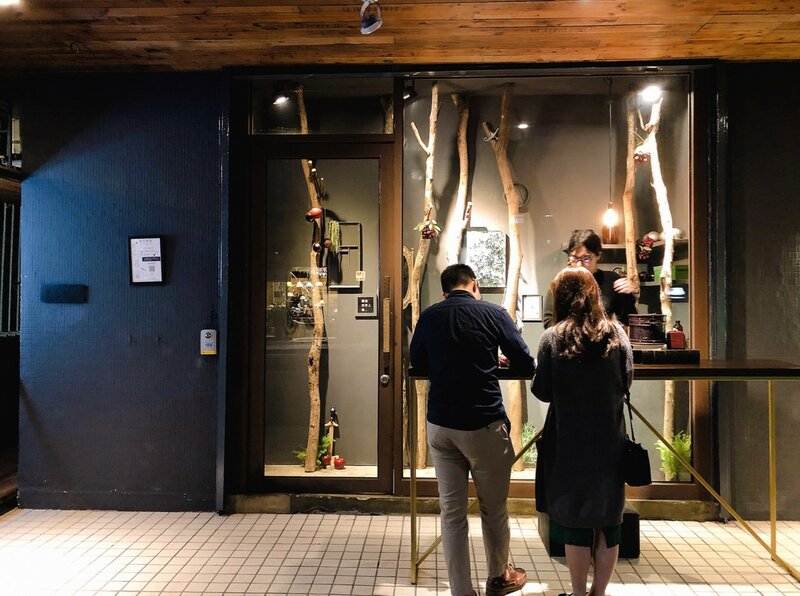 9,Jiankang Road, Songshan District, Taipei City. The nearby exit is No. 5 exit of Taipei Arena MRT station. It is very easy to find. You can only reserve seats online and pay with credit card prior via online. Please see the event as a performance. You would need to reserve online and pay first to attend. Can I pick the date and time? Can I experience during day time? 2019 無光晚餐體驗時間 2019/5/24 ~ 2019/6/30, 目前4/11已開始售票. 從以下圖片裡可看到週末有白天中午時段可以體驗, 晚上最早體驗的時間是 5:30pm,一場無光晚餐體驗大約 90 分鐘, 住在外縣市的人或需要趕車回家的人都適合參加. The event is from 2019/5/24 ~ 2019/6/30. It is already start selling the event ticket online.The picture stated that you can experience the event during weekend day time. The earliest event time is 5:30pm. The whole event is 90 minutes. You can experience this event even you live far away. Is there a minimum age restriction for Dining In The Dark? 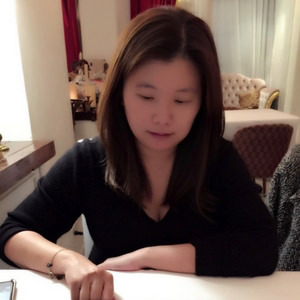 驚喜製造團隊主辦單位建議 15 歲, 也有年長的長輩 (外公外婆等級) 來嘗試無光晚餐, 在無光晚餐接待台可現場決定要無酒精或是酒精飲料, 我跟我朋友一個選非酒精飲料, 一個是選酒精調飲, 在黑暗裡也可以交換飲料喝, 非常有趣. Surprise Lab, which is the event planner, suggests the minimum age is 15 years old. 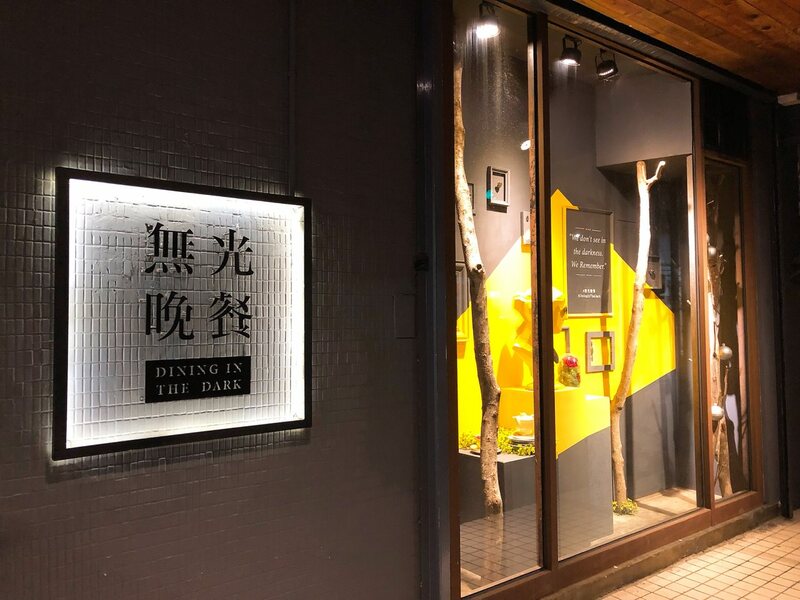 There are also grandpa and grandma experience “Dining In The Dark” event as well. At the counter, you and your friend can decide which drink you would like to order. I ordered a cocktail and my friend order a mocktail. We experienced each other’s drink in the dark is quite an interesting experience. Is it safe to attend Dining In The Dark? 餐廳內並沒有階梯, 不用怕踩空跌倒, 但是盡量還是不要穿高跟鞋, 店員也會戴著夜視鏡分批引導你到座位上, 在黑暗裡不要離開座位, 餐具會跟高級西餐廳一樣會依照料理而更換餐具, 餐具裡並不會有刀子. There is no stairs in the restaurant. Unless you are clumsy, you won’t fall. However, it is better not to wear high heels to the event. 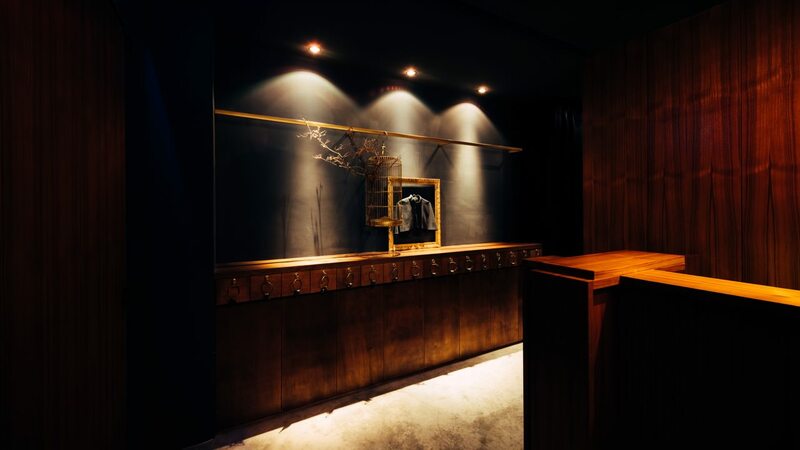 The staff would wear night goggle and guide you to your seats. It would be better not to leave the seats in the dark. They would also change the utensils due to different food. There wont be any knife involved. Can one person book the Dining In The Dark? Can the event location fit in large group of people? 主辦單位規定訂位只能偶數, 無法一個人或是奇數訂位,這並不代表單身的人無法參加, 也是可以找朋友或親戚一起來參加. 每個人皆是單人套餐 , 主辦單位設計了一些雙人在黑暗裡互動, 若是一個人是無法體驗, 至於包場問題, 需要直接問主辦單位. The answer is No. You can only reserve for even numbers (For example, 2, 4, or 6). Even though everyone is served with one-person dining set, there are interesting games for 2 people in between the dining. If you want to reserve large group, you would need to contact with the event planner. Are the dishes delicious? Will I be full after the event? Will I know what kind of food that I ate at the end? 為了保持神秘感, 我就不說我吃了哪些食材, 在黑暗中吃完總共五道菜餚後. 我個人覺得無光晚餐廚房團隊並不會因為顧客看不到而馬虎, 我覺得每道菜餚都各有特色,也不會故意準備過苦或是過甜的菜餚來整人, 整體比預期地好吃. 食材裡會有澱粉類, 一定會吃得飽, 體驗結束後會發一張卡片告知每道菜餚的食材. I am not able to say what I tasted. After tasting all five dishes, I personally think that the chef team did a good job. Each dish has its own story, balanced flavor and better than expected. Due to the starch, you would definitely be full. 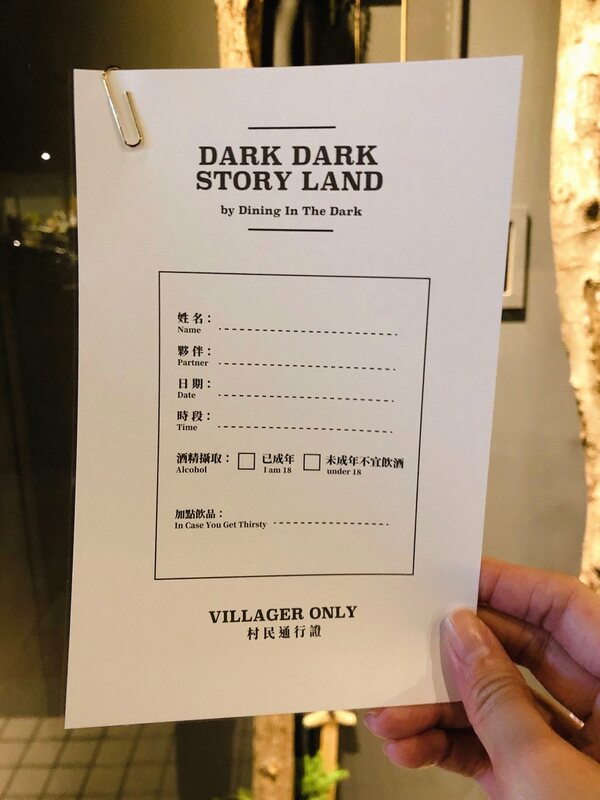 After the Dining In The Dark event, they would give you a card to reveal all the ingredients that you tried. Who are not suitable for this Dining In The Dark event? a. People who cannot understand one bit of Mandarin are not suitable for this event. The staff explain and guide the guest to eat via Chinese language. b. People with claustrophobia or afraid of darkness are not suitable for this event. c. 無法接受用手吃 Finger Food 的人: 雖然餐廳有準備濕布放在餐桌旁讓客人擦手, 但是仍有一些 Finger Food 需要用手拿起來吃. 別擔心, 並不是像 “Dancing Crab” 全部菜餚都是用手吃. c. If you cannot accept to use your hand for finger foods, this event might not be suitable for you. Please note that they place the wet towels on the table side. No worries, there is only a few dishes that would use hands to eat. 2019 Dining in The Dark Review? 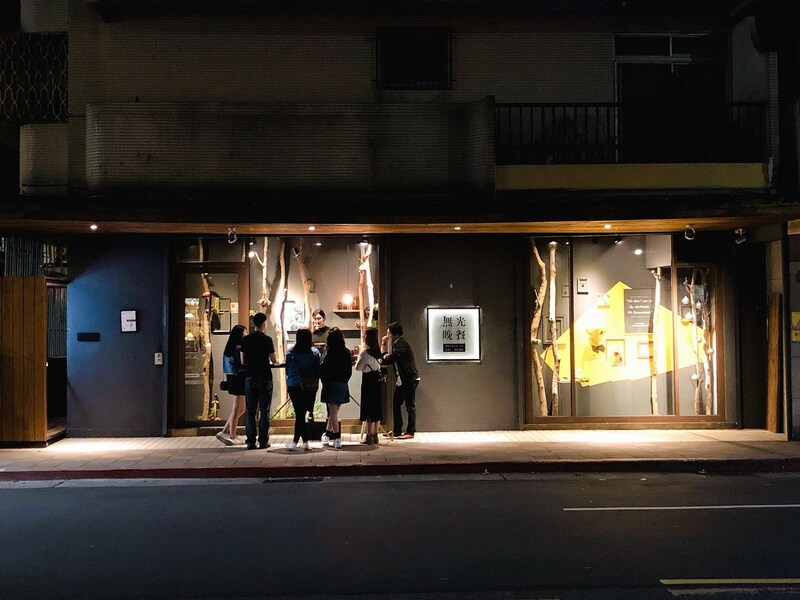 What is the Price of Dining In The Dark 2019? Price as the Picture states. The clear version is at the reservation link down below.